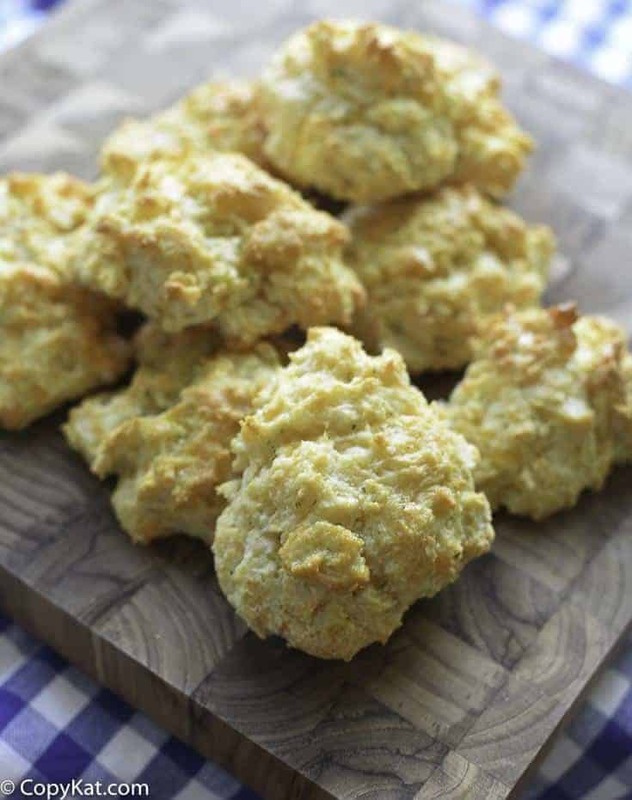 Home » Bread Recipes » Make Copycat Red Lobster Cheddar Bay Biscuits at home! Red Lobster Cheddar Bay Biscuits are a delicious addition to any meal. These biscuits are easy to make and taste so good. This recipe was adapted from the Orlando Sentinel Newspaper. Sure you can buy Red Lobster Cheddar Bay Biscuit Mix online now. You can even buy it in most grocery stores. Why would you want to make it from scratch? You can control the ingredients you put in the biscuits. For example, if you prefer organic ingredients you can use organic ingredients, you can’t buy an organic Red Lobster Cheddar Bay Biscuit mix anywhere at this time. You may also like to cook food from scratch. Perhaps you love an ingredient list that is simple to read and one that tastes great. These biscuits will do just that for you. These biscuits taste so wonderful when coming right out of the oven. Perhaps you want to pair these Red Lobster Cheddar Bay Biscuits with some Red Lobster Clam Chowder. Do you love the Red Lobster? Be sure to check out these Red Lobster Menu Items copycat style. These taste just as good when you make them at home. Heat oven to 450 degrees. Mix Bisquick, milk and cheese until a soft dough forms. Drop by spoonfuls onto an ungreased cooking sheet. Bake 8-10 minutes until golden brown. Mix butter and garlic powder. Brush mixture over warm biscuits before removing from cookie sheet. How can you substitute plain wihite flour for the bisquick? The addition of baking powder, salt, etc., and in what measurements? I would use bisquick. I don’t find homemade recipes for the bisquick to turn out quite as well. I don’t know why. They are “ok” but they don’t do well. Bisquick makes really small packages as well. Add about 1 Tbsp of dried parsley and a pinch of onion powder to the butter mix, as well. Don’t let copy cats fool you, the original and recipe used today at Red Lobster is on the Bisquick Box. If you can’t find it go on the web. Enjoy! I have tried this recipe, and there is something missing. We were at Red Lobster the other day, and had these, and they were so soft, and garlicy. I wonder if it’s baking powder? If they didn’t raise nicely your bisquick may have been a little old. Just copy and paste into a Word Document. I do it all the time. I use Print Friendly. It works great with Firefox. Go to printfriendly.com and add to your favorites. Bring up the recipe and click Print Friendly. Click on pdf and here you can print or save recipe. It will print or save only the recipe. I will most likely switch to that during my next update. There is the printer button, and if you click on share you can also print. 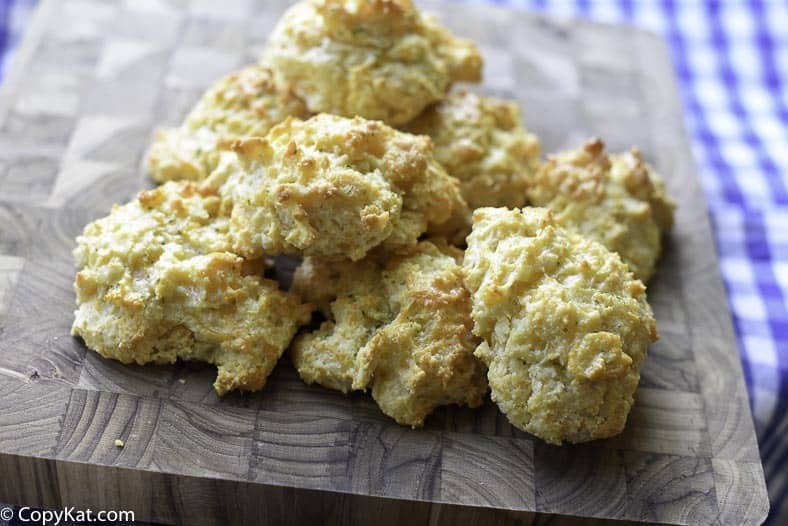 IF YOU USE PIONEER BAKING MIX THESE BISCUITS WILL BE MORE TENDER. you can use 4 cups of whole wheat flour intsted of using bisquick. From Stephanie – I think you will need to add fat and levening agents to this, otherwise they won’t raise. They were yummy Love them ! finally found a place where i can make the good stuff from restaurants at home.